A Chinese meal with friends, what a brilliant thing that is. The more people around your table, the bigger the range of dishes ordered and we all know the best Chinese feasts are the diverse ones. Fresh flavours and wild ingredients fused together to make delicious tasty experiences. But, no matter how big the party there’s always one that when asked utters the phrase that strikes fear in the heart “I’ll just have rice and a bit of chicken”. This diner is a scared of the unknown, they don’t want to looks silly picking something new in case they hate it and have to force it down in front of friends. Their boring chicken and rice, is added to the order - a bland taste in a list of variety. When the Chinese banquet arrives, and the dishes are placed in the middle of the table for all to tuck in and who is first with the big serving spoon? That oh so fearful person. They heap mound of the Special Singapore Prawn Noodles on their plate, after trying a bit and realising that this new flavour is pretty tasty after all. A quick bite of beef in black bean and that too is then devoured. They care not that they are literally starving the very people who had the courage of their convictions to pick something off the beaten track. If they had only taken the risk years ago they could have enjoyed Special Singapore Prawn Noodles or Black Been Beef all this time. Better yet they could have shared these unique tasty treats with others. Looking back on my blog, I’ve realised I have been Mr Chicken and Rice (bet you wondered where this post was heading didn’t you!) Much like the fearful dish picker, I have gone for the familiar in my posts so far. Games I had played in my youth, or ones I had been told are great. This is partly because until this blog gained legs and readers, I have bought games myself and had no intention of spending money on the unknown. I was like Mr Chicken and Rice; I didn’t want to shovel down something I didn’t like. The problem is, my banquet may include many different genres of dish but they are all safe choices, either familiar or pre-approved. There’s many more, treats out there and if I just took a risk I may discover something that resembles some Special Prawn Noodles. This opportunity presented itself recently on an eBay auction. 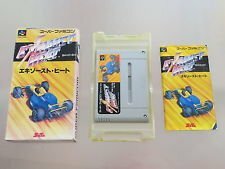 I bought a Japanese RPG I wanted for a bargain price and with it came another game essentially for free; a game called Exhaust Heat. I vaguely recognised the box, maybe from a back cover of a magazine but had no more knowledge on it than that. I could of course have looked online at reviews, but no, this was a chance for me to grab that big serving spoon and dig into the unknown. button and position the track. 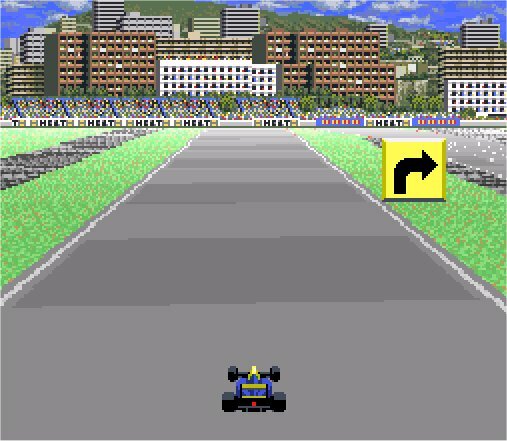 Having said that, there’s not a great deal of reason not to go off the racing line, with its arcade feel grass really doesn’t impact your speed too much and in this first track at least there seem to be no obstacles at the side of the road to damage you. 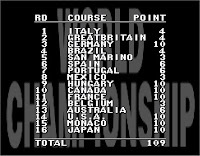 Considering I had never heard of, let alone played this game till it fell through my letter box, I qualified a respectable 4th and after an intimidating few screen that allow me to customise my car’s engine and tires I was thrown back into the driver’s seat for the “final” or “race” as its more commonly known to the Western speaking world. I of course have no idea if the poor translation is a fun quirk of playing the Japanese release or if it’s true of the EU version too. It’s nice having company on the road, though the other cars all look pretty similar and after the first corner you hardly see them. 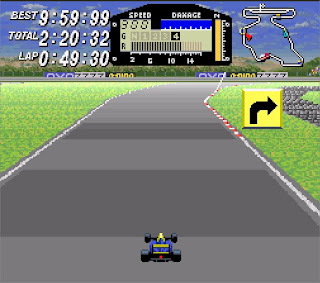 As you drive around the three laps of the race, it’s quite clear that unless you have upgraded your car before the start you are never going to catch the front runners, and those behind you after the first corner seem to remain behind for the entirety of the race. For a car racing game, it really doesn't feel like you’re racing anyone at all. It would be better if you had an in car radio to hum along too as you drove, but the lack of in game music means all you have to listen to is the high-pitched continuous whine of the car. 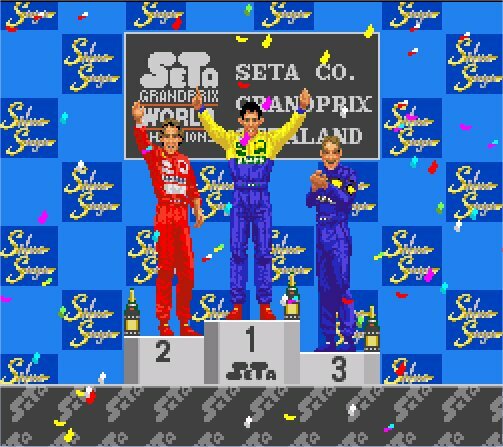 I started the Italian GP in 4th I finished in 4th, it really wasn’t a very exciting way to spend a few minutes. The second circuit is Great Britain and predictably it’s raining. I don’t know if my Italian experience had taught me much. As before I qualified 4th, had a race and finished that in 4th. Maybe if I took some time on the practicing mode before the race I’d do better. I doubt it though, racing glory seems very much dependant on how good your car is, rather than how good a driver you are. It isn’t a level playing field, and it’s odd that you essentially have to grind through a few races before you’re in a car that can even vaguely match the leaders of the race. my standard 4th and achieve a 1st. With success come the riches and the ability to buy upgrades. Now I know very little about Formula One or cars in general, but I do know that when it rains you put on wet tires, and the best cars have the best engines. So with my winnings the first thing I bought was a more powerful engine. Finally my car had the grunt to compete with the front runners, but with that evaporated the serine calm lonely race experience and instead came frustration. Opponents may be able to drive through one and other on the grid, but even the slightest graze with another car causes you to spin out of control. This may initially all seem very exciting, but just one collision means you have no way of catching up with the pack. Even if you do your prize fund (the life blood of this game) will be so small after damage is deducted that the race is essentially a write off. 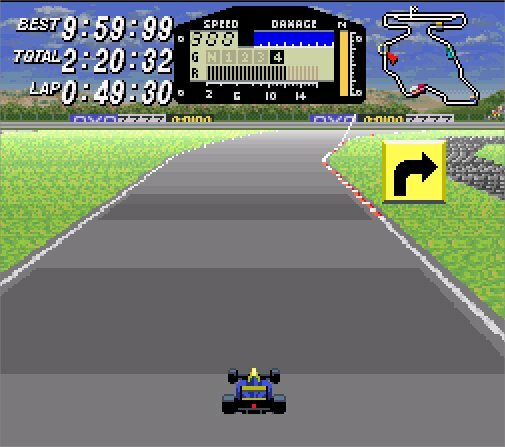 Some may claim this makes the game a more accurate reflection of real life F1. Racing cars are delicate and collisions devastating. But, if accurate simulation is the goal why can the car still drive regardless of how much you plough it into other cars or walls? Provided you avoid damage this continual flow of upgrades slowly chips away at the game’s challenge till once again you are racing alone – this time in first position. Not often does a game’s difficulty actually curve downward, particularly when it rains. This does have the noticeable effect on your cars handling, but provided you are using wet tires your can easily motor past the other cars that are over cautious. Looking online after a few hours with this game reveals a few things that I probably would never had known. 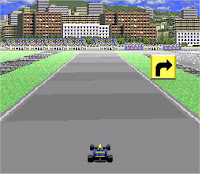 The tracks are all fairly accurate portrayals of those in the 1992 F1 season, even including the appropriate advertising hoardings and track design. There are even tributes to drivers at the time, Mansell, Senna, Prost. 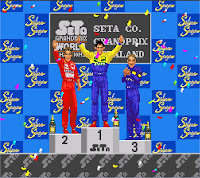 Its nice to see a variety of drivers excelling in different races, but this also has the knock on effect of making the game easier as you have no specific rival. Watching ‘lets plays’ reveal the EU version to be identical to my Japanese copy. So, playing the Super Famicom version really isn’t a problem as there seems to be more English text than Japanese in the game anyway. Having said that, you can get a boxed complete PAL version on eBay for less than the price of a Chop Suey Set Meal for one (£4.99) so you’d probably end up paying more to have your box art in portrait rather than landscape form. 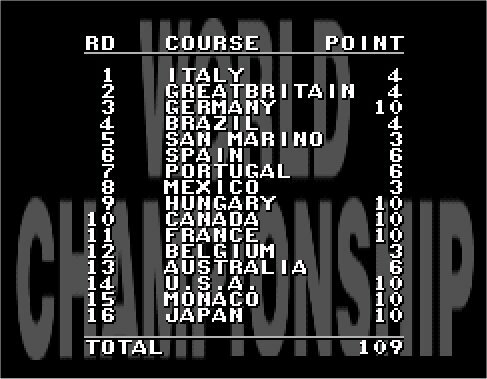 Essentially the greatest flaw in this game is that it is a racing game where you don’t actually race anyone for the majority of a season. At the start you are so under powered it is impossible to compete, by the end so over levelled that the challenge is gone. There are a few races in the middle where you are on a par with others, but those are more a frustrating exercise in avoiding damage as cutting corners easily gets you past opponents. Any long term challenge would be self created; how many races can I go before I lose, can I finish a race using only one hand, but of course there are no in game rewards for this. A complete season only takes a few hours and after that provided you have any other game to play – you will never play Exhaust Heat again. The game isn’t Special Singapore Prawn Noodles, it’s bland inoffensive and a bit of a slog by the end. If anything it’s a dish that looked exciting on the menu, but when it arrives is actually mainly watery flavourless sauce. None of your friends like it, you shovel it down just to finish it, a little bit embarrassed and really wishing you had just ordered Chow Mein in the first place. To import games from Japan, eBay isn't your only option. I always check on sites like Solaris Japan as often they have a game in stock cheaper than the final price it goes for on eBay. The also have a few gadget that removes any worry of getting charged extra at customs, so they're worth a look. The Sequel is much better I hear, but some things are best left in the past.